The greatest love story of our time has officially landed its own reality show. E! 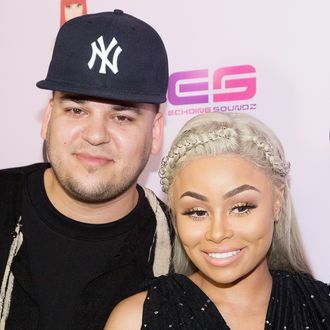 just green-lit Rob & Chyna, yet another spinoff of Keeping Up With the Kardashians — this one about Rob Kardashian and his fiancée/hustle queen Blac Chyna (soon to be Angela Renee Kardashian) and their impending spawn, whom fate (and a lot of finessing on Chyna’s part) has chosen to carry on the Kardashian dynasty. The show won’t play out on Snapchat, but will instead get the docu-series treatment à la I Am Cait, with six hour-long episodes ordered. The whole shebang is set to premiere later this year, of course, followed by a special in which the world will get to witness the glorious birth of Baby Kardashian, a.k.a the cultural event of the century. Oh, to be a fly on Kris Jenner’s mansion wall right about now.